Base price per 100 ml: 15,80 €. 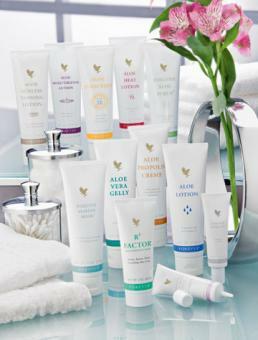 An excellent, all-over moisturiser for your body and face, Aloe Lotion combines the highest concentration of pure, stabilised aloe with collagen, jojoba oil, elastin and Vitamin E in a finely textured lotion, light in scent but long on soothing dry, irritated skin. One of our signature products, Aloe Lotion is a wonderful, all-purpose, concentrated skin lotion with Jojoba Oil and Vitamin E to moisturize and soothe the skin. Elastin and collagen are added to this fine mix to assist in keeping the skin smooth and supple. It is an ideal choice for applying to chafed, dry, wind-blown or weathered skin. Light in scent but long on soothing dry, irritated skin, Aloe Lotion quickly restores your skins delicate pH balance to keep it supple and soft. Our improved formula takes advantage of the latest breakthroughs in skin care technology to make Aloe Lotion feel sensational all over your body and face! Directions:Apply liberally. Best results are obtained by gently massaging until lotion is absorbed into the skin. Datasheet : Aloe Vera Moisturizing lotion, Aloe Lotion 62, 118 ml (PDF) -> Open in a new window.